Powers/Abilities: Moon-Man is "master of many sciences and independently wealthy". He operates out of a penthouse, entering and exiting through a hidden entrance accessed through a private elevator. He's a good fighter and good climber, easily scaling the walls of a suspect's house to enter through the second floor. History: "On nights when the full moon shines the mysterious Moon-Man comes to the aid of those who have been oppressed and cheated by powers out of reach of the law. Like a nameless shadow he comes and goes --- hunted alike by the underworld and the police!" 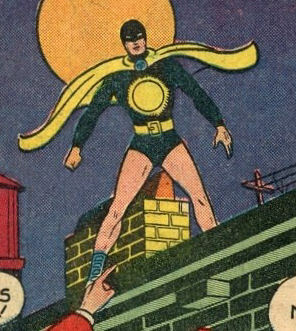 Operating out of a city penthouse, Moon-Man defends his city from wrong-doers. In his only recorded case, he dealt swift justice to Boss McGool, a business man who deliberately sold rotten meat to an orphanage, resulting in several children being poisoned by their Christmas dinner. Comments: Created by an unidentified writer and Fred Guardineer.